Aditi Raychoudhury. Dabbawalla. 2006. Pen and Ink. 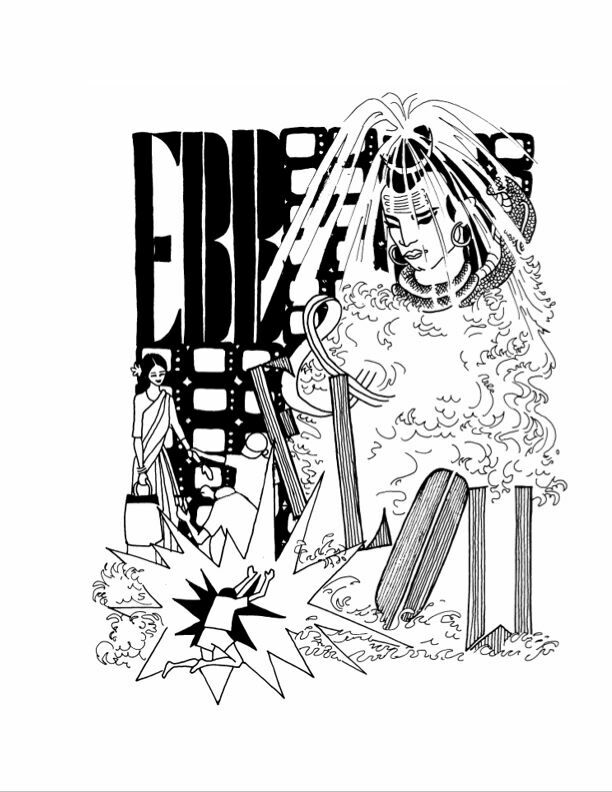 My illustrations for The Loudest Firecrackerby Arun Krishnan have been published by Tranquebar Press (January 2009). This will be the fourth book to be published with my illustrations. Aditi Raychoudhury. 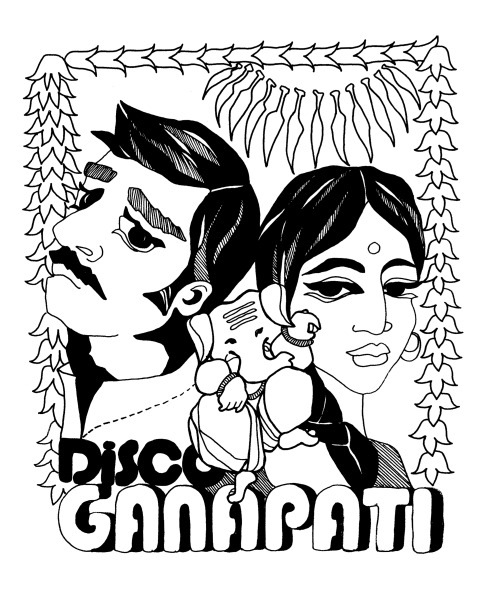 Disco Ganapathi. Pen and Ink. 2004. Aditi Raychoudhury. 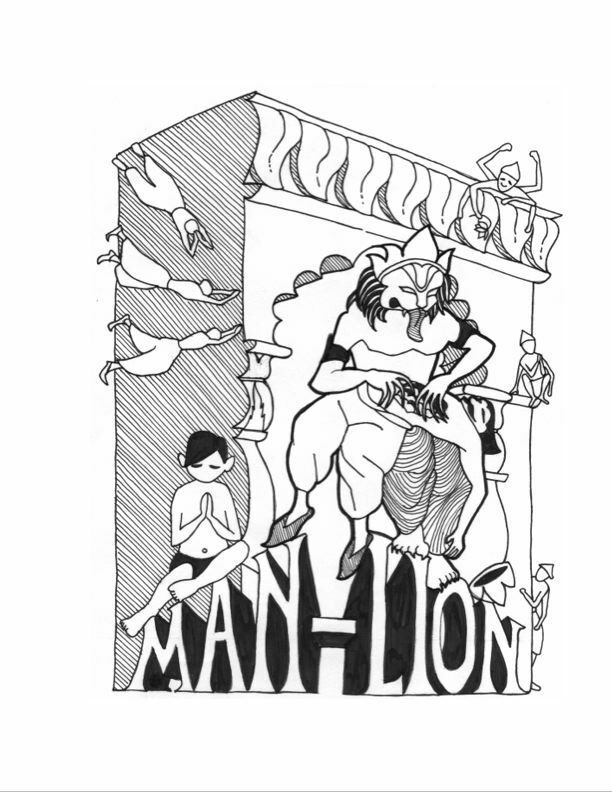 Man-Lion. Pen and Ink. 2004. Aditi Raychoudhury. Ebb and Flow. Pen and Ink. 2004. Aditi Raychoudhury. 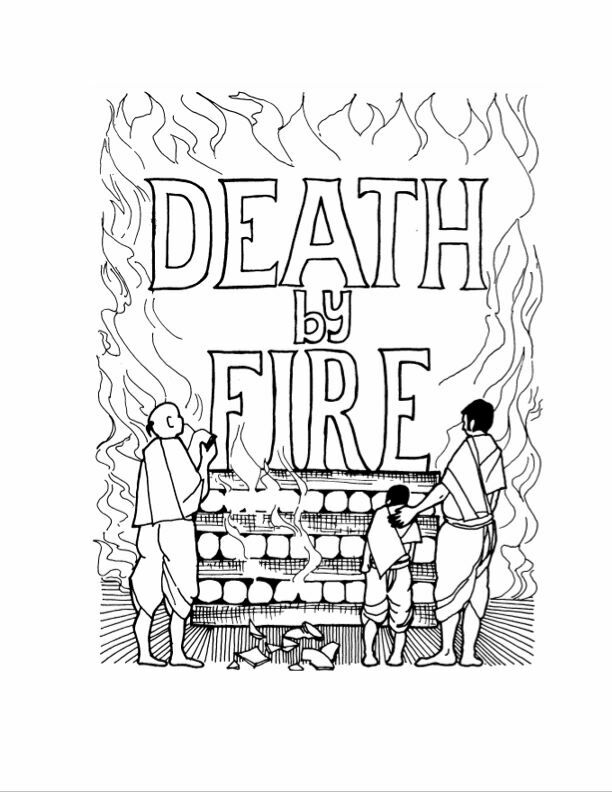 Death By Fire. Pen and Ink. 2004. It’s India versus Pakistan and as the excitement soars in the final over of a memorable cricket match, ten-year-old Siddharth sets off a firecracker. The blast that follows will change his life.Siddharth discovers that growing up isn’t easy: he has to handle a tragic death, his best friend is gravitating to a rightwing political party, and his film-maker father has troubles of his own as he shifts away from the commercial but lucrative world of Hindi movies. And Poona is nothing at all like Bombay. Will tennis matches help, or can his mother’s beautifully retold myths do the trick? Will instant noodles come to Siddharth’s rescue, or will it be his old elocution standby, The Charge of the Light Brigade? In this touching, poignant and often hilarious debut novel, Arun Krishnan has created a world we all recognize, one that will appeal equally to young adults and a more mature audience. “Please disregard the message on Amazon that says Ships within 1-2 months. It ships instantly, like any other order. I am working with Amazon to get this message removed. The novel is excellent reading for friends and family, so don’t feel scared to order more than one copy. (I think the Surgeon General recommends 4). hi aditi. love the way your work reflects an indianness, that designers like me strive to attain. i bumped into your blog through google while looking for dabbawala images – your dabbawala is fabulous. please look at my take on the dabbawala on my blog. I absolutely love your drawings. They depict life in such a simple yet stylized way. 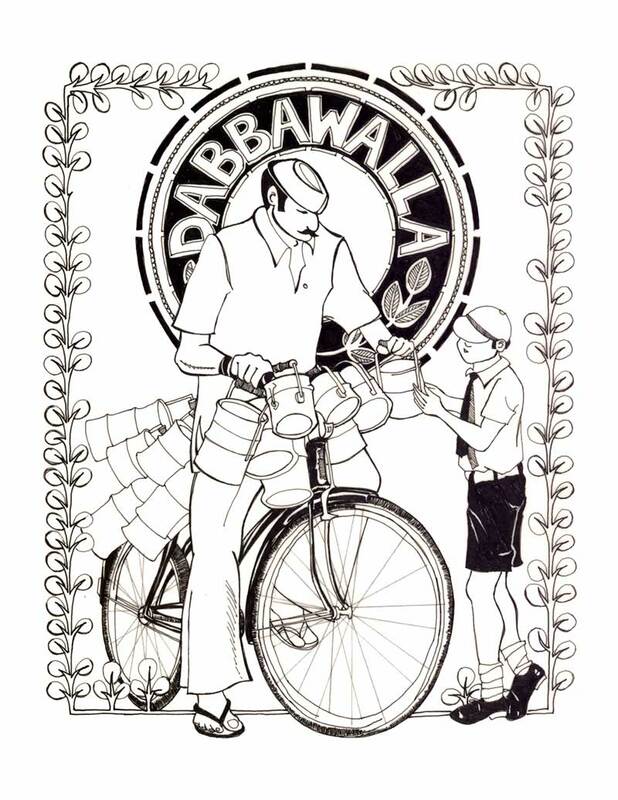 I would love to be able to reprint the Dabbawalla image on a T-shirt. Is this possible? Or do you have any other images depicting bicycles? We recently ordered a couple of copies of ‘The Loudest Firecracker’. Your illustrations are just fabulous! They brought back many fond memories of India. I just read The Loudest Firecracker, and I was in awe of the beautiful artwork. Really amazing. I wrote a review of the book. I highly recommend it – I hope it’s not too long, but here it is. THX!! Arun Krishnan whacks the coming of age story out of the park in this novel about a young man struggling to come to terms with life, death, politics, adulthood and most importantly, national sporting events. If Kurt Vonnegut, Milan Kundera and Ernest Hemingway got together to co-write a modern mythology set in 1980’s India, The Loudest Firecracker would be a product of this collaboration. With imagery recalling the allegories of the Bhagavad-Gita, and a writing style that is smooth, yet deep, Krishnan pens a beautiful tale with seeming ease and humor that examined more closely has all the intricacies of a finely woven tapestry. The Loudest Firecracker follows the saga of Siddarth, a ten year old boy forced to move from Bombay to Poona – from the big city lights to the small dirt roads of a less economically prolific town. In Siddarth’s story, we see India in the 1980’s – shortly after the assassination of Indira Ghandi – during a time of political and social unrest. The ethos of a people preoccupied with terrorism, political slant and race hits very close to the home of the 21st century reader. We also see Poona through the eyes of Arun Krishnan, who moved to the United States in the mid-1990s. He brings to life the sounds and smells of a city and people most of us will never see first hand. Krishnan brings us two Indias: the gold-paved streets and superficiality of Bollywood, and the mud and sewage soaked alleyways of the Maharashtran ghettos. He shows us the dichotomies of modern society by bringing us a divided country – Muslims on one side, Hindus on the other – a place where politicians use hope as a tool to manipulate the disenchanted masses. He brings us the rivalries between India’s and Pakistan’s cricket teams. He illustrates the struggle of a boy who desperately wants to use his left hand, but is forced to use his right. And through it all, the young hero, Siddarth is pushed and pulled in every direction, teetering on the edge of something he doesn’t understand. However, we can all relate to Siddarth’s struggle. His innocence is like the wisdom of someone with many past lives. 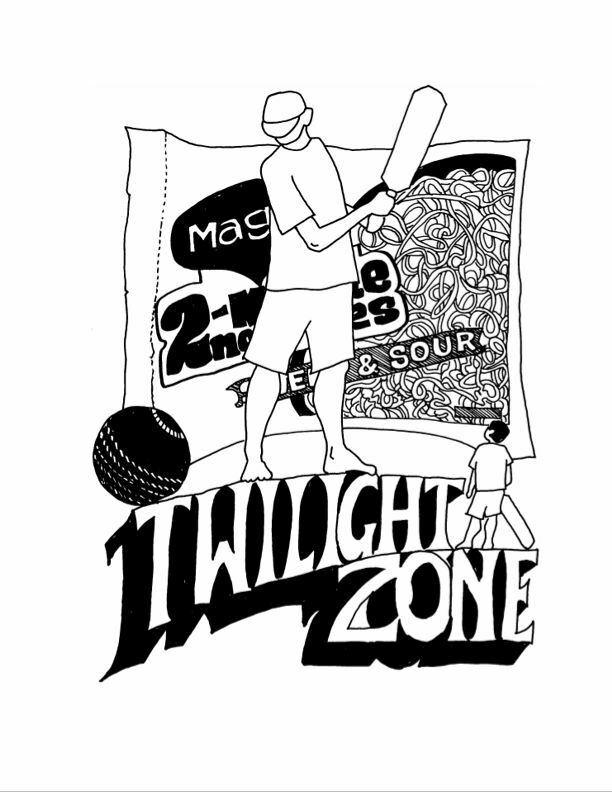 Siddarth, like most ten year old Indian boys, loves cricket – especially if it involves watching an Indian national team game. On the day of India’s shocking last minute loss to Pakistan, the social tension comes to a hilt and a wave of violence sweeps across India. Was this violence and bloodshed caused by young Siddarth, who lit a loud firecracker in a crowded place, or was it much more deeply rooted in the souls of the populace? Was the death of his mother caused by this small act of childish recklessness? Was he the cause of the uprising of an extremist politician’s agenda? These are some of the questions Siddarth must explore in his journey. In this novel, we see the huge ripple effect that a small firework can cause. We see a boy whose love for his mother gives him the strength to stand up in the face of adversity. We follow him as he struggles for his father’s affection; he struggles to fit in with the wrong crowd; he struggles to attract the attention of the neighbor’s beautiful daughter, and when he discovers his passion for tennis, he struggles to beat his best friend in the match of his life. Despite all this struggling, Siddarth, and Krishnan, always stay upbeat, making sure not to dwell on the negative aspects of life. Krishnan gives us all in his debut novel. After turning the last page, the reader will feel as if he just spent some time with close friends, with a sense of satisfaction held only on momentous occasions. Rich in allegory, and tersely witty, Arun Krishnan delivers a reading sensation that takes the reader home, no matter where that home may be. Thank you for your kind words. Good luck with your projects. WOW Fantastic illustrations Aditi. I can’t wait to get the book and relish all of them, along with the story of course. Well done! Keep up the great job! Thanks, your encouragement keeps me going – as I am working by myself … Thx!!! your sketches will make it to gallery one day should i say very soon . And your picture books will be duly awarded.